The line sketch on the right show the church prior to the addition that was added in 1999-2001. The current building consists of the original building completed in 1868 and the addition added in 2001. 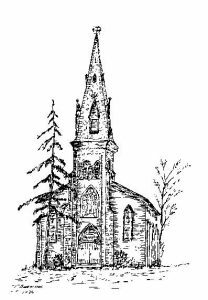 Welcome to the historic church sanctuary that is St. Andrew’s Streetsville. Opened in November of 1868, this handsome red-brick church replaced a white-painted frame church that had stood in the cemetery land to the south since 1824. 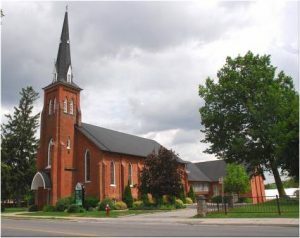 Originally called simply Streetsville Presbyterian Church, the name St. Andrew’s was adopted by the congregation in 1908, so that all of the early records, and the original church dishes on display, use the original name. At the back of the sanctuary is the original balcony, which housed the choir and the first organ, as well as the overflow congregation. In the 1960’s a higher safety wall was built, and the slanting floor leveled to produce an extra young people’s classroom. Behind the sanctuary is the vestibule, with a door on the south wall leading to the stairs to the balcony, which in turn has a door leading to the steeple and the rope for tolling the historic church bell. Hidden under the carpet in the vestibule is the old trap door, where in former days the piano was hoisted from the basement to be played for concerts. Part of the original block and tackle used for this lift is in our table displays. As you look up the centre aisle, you will see the original pews, with number plates on the arm next to the aisle. In the early days the pews were rented, and families always sat in their own rented pew. These rents provided the income for the church before the days of free-will offerings and envelopes. Notice also the pull-out seating boards to accommodate crowds; at the end of the 19th century attendance could reach 300 persons. Originally lit by coal oil lamps, two of the original iron sconces (retrieved from a collection in the old steeple and repaired and restored) are on display. The brackets to hold the sconces are still visible, just below the magnificent brass candelabra, designed, created and given to the church by Mr. Ron Behoo. At Christmas the flaming candles in these candelabra create a magnificent glow. Later the church was lit by gas, and the lighting fixtures were of brass. When the church switched to electricity in 1909, the same gas fixtures were adapted to the new source, and later repainted black and gold. On the north wall are mounted two large montages, with pictures of every minister of the congregation except the first one, the Rev. Andrew Bell. The first group, arranged around the picture of the 1824 church, is comprised of the ministers up to the year 1907. The second group, the ministers since 1907, are grouped around an early picture of this building, as it looked in 1868 before the addition of the chancel area. The stained glass windows in the sanctuary were installed in 1926, replacing the original coloured windows. The colours in the chancel windows are striking, and can be viewed from the opposite side in the Fireside Room in the recent addition as well . On the north wall, the five windows honour five pioneer families: Irwins, Steens, Blains, Weylies, and Rosses. The window honouring Ephraim Steen and Jane Douglas is significant in recognizing the prominence of the Steen families and their intermarried kin, who made up fifty percent of the large congregation by the turn of the last century, and whose direct descendants, Homer and John Dunn and their family, are still members of this congregation. The Weylie window evokes another Steen-connected family. For over 50 years John Weylie Senior and Junior served as Clerks of Session. The wooden cross on the chancel wall is in memory of S. Edmund Wolfe (1904 – 1967), another pioneer family in the congregation. The pulpit and side chairs are part of the original furnishings of the church, dating to 1868. Most first-time visitors to St. Andrew’s remark on our magnificent carved communion table. This unique table was presented in 1946 by Mrs. Robert Greig, long-time choir leader, in memory of her husband and daughter. On the table stand two brass candlesticks, honouring the memory of two very young members of the congregation, Haddo Bruce and Rick Markell, who died together in a small plane accident at the north end of Streetsville in 1973. The bronze cross was originally from the old Knox Vaughan Presbyterian Church, given in memory of the Rev. Peter Glassford. Because of his relationship with the Weylie family, the cross was given to St. Andrew’s when the old Vaughan church was closed. The brass reading stand on the table, and the wooden lectern, were presented through the congregation’s memorial fund. The piano was a gift from Henry and Jean Stewart honouring the women and men who have played the piano and organ and led the choir in St. Andrew’s over many years. The five windows on the south wall are also in memory of pioneer families, Barbers, Websters, and McClures, as well as honouring an early pastor, Rev. James Breckinridge, and those from St. Andrew’s who served in World War I, including those who gave their lives. On the back wall are two framed and mounted World War One and World War Two Honour Rolls, listing the young people from the congregation who served in those conflicts. Note that the design of the World War Two Honour Roll contains the initials of A.J. Casson, famous Canadian artist who designed these scrolls for Canadian churches in the 1940’s. The pine harvest tables in the sanctuary contain displays of old Bibles and other books, historic documents, pictures, and numerous artifacts relating to the history of St. Andrew’s. Of special interest is the beautiful old communion silver and some information about the use of wine in communion. Our historic church has been greatly enhanced by the fine addition completed in 2001. The building was planned to complement and enhance our existing 1868 building . People say, “It looks as if it has always been there!” From the pitch of the roofline, the colour of the shingles, the matching gothic-shaped windows in the hall, the incredible match of the old bricks (the closest matching ones imported from Pennsylvania), the building nestles behind old St. Andrew’s with a real sense of belonging. Notice particularly our lovely “Fireside Room”, with its main wall consisting of the back wall of the old church. Please explore the 21st century parts of this historic building.